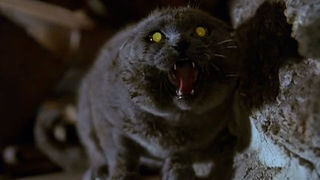 Sometimes dead is better, but the chances of Paramount’s upcoming Pet Sematary remake (an inevitability, after the massive success of It for Warner Bros.) actually being something worth watching have increased. That’s thanks to the participation of directors Kevin Kolsch and Dennis Widmyer, whose 2014 film Starry Eyes—to be as spoiler-free as possible—took an aspiring actress’ quest for fame to some disturbing places. That film was partially funded through Kickstarter, making this a big step up for the duo. Ironically enough, Kolsch and Widmyer are also currently attached to direct a sequel to Andy Muschietti’s Mama. Muschietti, another director who broke into the big time with a Stephen King adaptation (the aforementioned It), previously expressed interest in a Pet Sematary remake, but is now busy making a sequel to his smash spooky-clown hit from earlier this fall. A replacement for The Ramones on the revived Pet Sematary soundtrack has yet to be determined, although in that case, dead may actually be better.